It's been a long winter. March is coming in like a lion. Who wants to leave the comforts of home and hearth for an adventure? You don't have to give up the coziness. You can share the vicarious adventures of Captain Geoffrey Thorpe as he gives his all for Queen and country. Let's hit the high seas with one of films' greatest screen teams, Errol Flynn and Alan Hale. Dashing screen star Flynn's many skills as an actor were seen to great advantage in the epic adventure films produced by Warner Brothers in the 1930s and 40s, mostly directed by Michael Curtiz. Reportedly, the actor and director had a thorny relationship, but the product on the screen was the best of its kind and timeless entertainment. An excellent appreciation of Errol Flynn can be found in this article by Rebecca Barnes aka Classic Becky. Singer and actor Alan Hale had been in pictures since the age of 20 in 1912. Fond as I am of the output of the silent era, there are some actors that are meant to be heard and that rich baritone of Hale's is a gift. 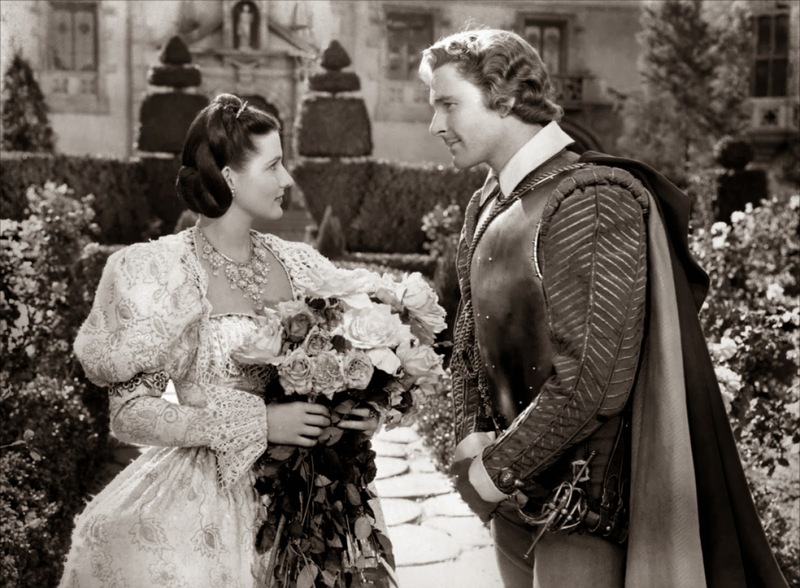 Fourteen times Flynn and Hale shared the screen in films made between 1937s The Prince and the Pauper and 1948s Adventures of Don Juan. 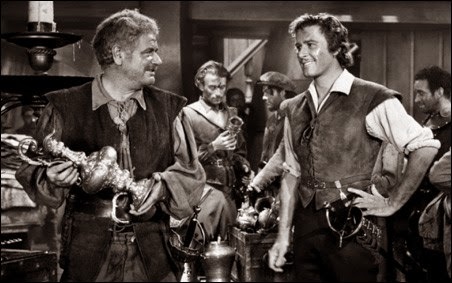 Their audience appeal was at its height in pictures like The Adventures of Robin Hood, Dodge City and The Sea Hawk where Hale's blustery and loyal sidekick was the perfect companion to Flynn's committed and sometimes foolhardy heroes. 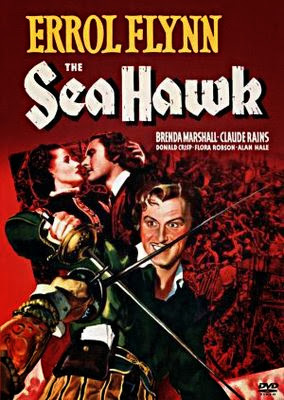 The Sea Hawk, released in 1940, is said to be a remake of the 1924 film based on Rafael Sabatini's 1915 novel, but I can find no similarities beyond that of the title. The script for the 1940 film is by Howard Koch (Three Strangers) and Seton Miller (Two Years Before the Mast). The thrilling score is from the glorious pen of Erich Wolfgang Korngold (The Adventures of Robin Hood) and it is the well from which springs all the heart and emotion of this epic adventure. The Sea Hawk is the story of two empire builders, Philip of Spain and Elizabeth of England. Philip is amassing his Armada and Elizabeth, apparently a fiscal conservative at this time is wary of her minister's advice to increase her naval strength. Spying and skullduggery is rampant at court. On the high seas, a group of privateers known as the Sea Hawks plunder the plunderers to fill the coffers of England. Chief among them is Flynn's Geoffrey Thorpe, a favourite of Her Majesty. Flora Robson, who first portrayed Elizabeth I in 1937s Fire Over England for Alexander Korda, once again takes on the role and of all the actresses who have given their all to the task Ms. Robson (Black Narcissus) is my favourite. Her Elizabeth is shrewd, imperious, slyly humourous, quick to temper yet nobody's fool. In short, she is a joy to watch. Henry Daniell plays Lord Wolfingham, a man with loyalties only to himself and if spying for Philip will advance his personal cause, he has no qualms. Daniell is such fun to watch in the villainous or unlikeable roles. His unbending nature and mellifluous voice, like a charming snake, adds so much to his characterizations in films as diverse as Camille, Holiday, The Body Snatcher and The Philadelphia Story. Donald Crisp (How Green Was My Valley) as the trusted minister Sir John Burleson gives an air of trustworthiness that is a comfort in the palace. Comfort is needed when the ambassador from Spain, Claude Rains as Don Jose Alvarez de Cordoba makes his presence felt. Here Rains (Mr. Smith Goes to Washington) pulls out his patented "he's saying all the right things, but I wouldn't trust him as far as I could throw him" character. Don Jose's only human side is evident in his relationship with his niece Dona Maria played by Brenda Marshall (Captains of the Clouds). Maria, our love interest in the picture, is established as worthy in her first few scenes. On the journey to England's court, their ship is captured by Thorpe despite the diplomatic flag they carry. We first see Maria as playful in a deck top tennis match with her maid Miss Latham played by Una O'Connor (Cavalcade). Confronted with her captor she is a haughty aristocrat. When she sees the released British galley slaves there is pity and shame on her face. Maria as played by Ms. Marshall is a keeper. Errol Flynn and a beautiful leading lady, you would think that's all you would need, wouldn't you? But, no. Thorpe is notoriously tongue-tied around the ladies, as his crew duly notes. "I hear the Queen is the only woman he can speak to without buckling his knees." "Man to man I calls it!" The crew is a great part of what makes The Sea Hawk work. Beyond Alan Hale we have J.M. Kerrigan (The Long Voyage Home) as a loyal and headstrong sailor. David Bruce (Lady on a Train) makes a strong impression as a confederate with hidden depths. William Lundigan (I'd Climb the Highest Mountain) swings into action with his heart-melting smile. Uncredited in one of his first half dozen film bits is 36-year-old Edgar Buchanan (TVs Petticoat Junction) who had just turned over his thriving dental practice to his wife in order to pursue acting. As his role here shows, Mr. Buchanan was quickly on his way to becoming the greatest scene thief of all time. The Spanish military is ably represented by Captain Lopez played by a courtly Gilbert Roland (The Lady and the Bullfighter), Captain Mendoza played by Pedro de Cordoba (Sabotage), Ian Keith (Nightmare Alley) as cagey Peralta and Jack La Rue (Road to Utopia) as over-confident Lt. Ortega. Keep your eyes peeled for the likes of Whit Bissell, Jay Silverheels, Gerald Mohr and John Sutton. There may be a drinking game. 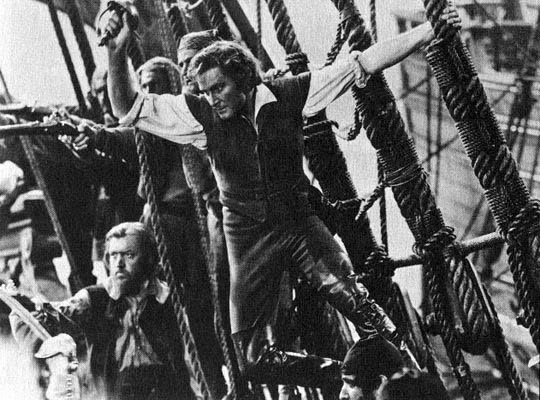 The action set pieces in The Sea Hawk are every bit the exciting, escapist fare they are meant to be yet still have their poignancy and high stakes investment. Political tensions are at their height and Thorpe takes on a covert operation to steal plunder meant for Spain's coffers at its source in Panama. Naturally, the Queen must disavow any knowledge of his actions. Despite all efforts at secrecy, the spy network of Lord Wolfingham does its job and Thorpe and gallant crew sail off into a trap and tragedy. The segment of the film which takes place in Panama replaces the sumptuous black and white photography we have been enjoying with a sepia tone denoting the exotic and steamy locale. A bold and successful move by three time Oscar nominated (Captains of the Clouds, Sergeant York, The Private Lives of Elizabeth and Essex) cinematographer Sol Polito. 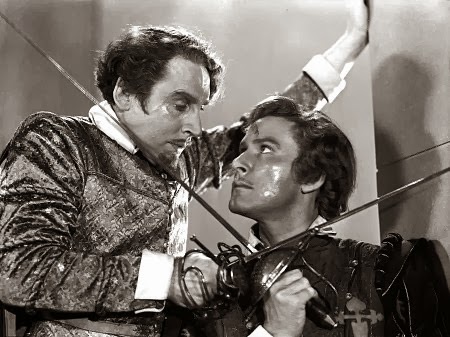 All of the intrigue, romance and action of The Sea Hawk leads to that most satisfying of filmdom events, a climactic duel between adversaries/a touching reunion of lovers/a raucous cheer from lovable rogues. Take your pick, it's all there and it's all yours. Dame Robson's lines as Queen Elizabeth at the conclusion are a reminder of the time of the movie's creation. "And now, my loyal subjects, a grave duty confronts us all: To prepare our nation for a war that none of us wants, least of all your queen. We have tried by all means in our power to avert this war. We have no quarrel with the people of Spain or of any other country; but when the ruthless ambition of a man threatens to engulf the world, it becomes the solemn obligation of all free men to affirm that the earth belongs not to any one man, but to all men, and that freedom is the deed and title to the soil on which we exist. Firm in this faith, we shall now make ready to meet the great armada that Philip sends against us. To this end, I pledge you ships - ships worthy of our seamen - a mighty fleet, hewn out of the forests of England; a navy foremost in the world - not only in our time, but for generations to come." Errol Flynn and Gilbert Roland - what's not to like? And that score and that cast! the Curtiz/Flynn/Warners collaboration at its finest and not to be missed. Great post, CW - as rousing as the film! Gilbert Roland is so ... so ... so civilized, so handsome, so exemplary an opponent. Sigh. It was fun to revisit this favourite movie and share it with fans, once and future. Well bless your peapickin' little heart for linking to my article on The Great Flynn! Thanks CW ... The Sea Hawk is a top favorite Flynn movie to me. I think the swordfight with Daniell at the end is the best on film. The music, those fabulous giant shadows on the walls ... completely thrilling. I just loved your article, and the good taste and obvious intelligence of your choice for March! Becky, I was sorting my thoughts on Flynn and realized that you had said it all, and better, so I was free to move on to some other favourite things about "The Sea Hawk". Such a movie! This was one of those choice films where everything just fell into place PERFECTLY. The cast, the music, the settings, the cinematography...everyone was at the top of their game. I really love the camaraderie Captain Thorpe has with his men. In "Captain Horatio Hornblower" you can really sense that they were missing that prime ingredient in the film. Gregory Peck needed to be a Captain Thorpe and somehow didn't manage to pull it off. There'll never be another Flynn. "There'll never be another Flynn." So true. His acting commitment to the role of hero is total with none of the self-consciousness or winking that we get from others. We can care more because he did. One of the great ones, and I make no apologies for that. For me, its one of the supreme examples of the studio system at work. I'm continually struck by Flynn's performance here, how on target it is and how different it is from some of his other swashbucklers. In CAPTAIN BLOOD, he's angry and defiant, in THE ADVENTURES OF ROBIN HOOD he's "brave and reckless" as Maid Marian says and in THE SEA HAWK, he's gallant and courteous, and as you pointed out, very shy and demure around women. He nails all three characterizations. All swashbuckling costume adventures, but the roles are quite different and Flynn is totally convincing in all three. A truly underrated actor. Yes, Kevin. When an actor such as Flynn is such a mega-star, the talent is taken for granted or overlooked altogether. I don't know why that is so, but does the man a great disservice. Caftan Woman, I must confess I usually gravitate more to suspense movies (especially those of a certain Mr. Hitchcock, and/or really good Hitchcock manques :-)), but I've been meaning to expand my movie favorites to swashbucklers -- blame it on THE BLACK SWAN and Laird Cregar. 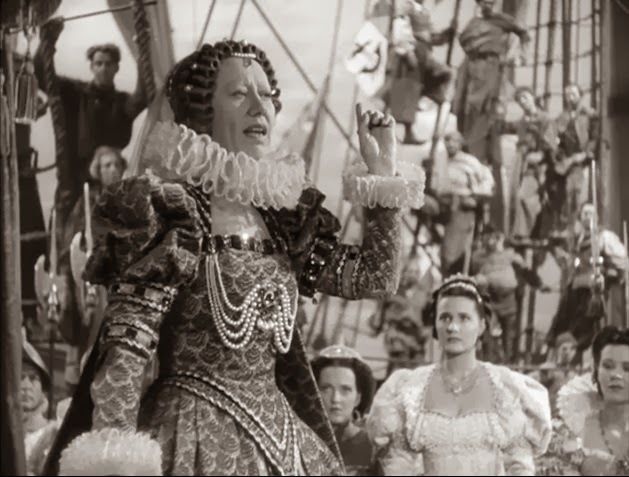 Yes, I know Laird wasn't in THE SEA HAWK, but your great post got me thinking THE SEA HAWK would be swell place to start, especially Dame Flora Robson's stirring speech; kinda makes me think of HENRY V and that stirring "He who shares his blood with me shall be by brother" speech. Thanks for turning me onto a great film, C.W.! "The Black Swan" has a lot to answer for! Dorian, I know you will find much to enjoy about "The Sea Hawk". The spying and political intrigue is right up your alley. Plus, a black & white Flynn compares admirably to a Technicolor Power. Wow, smashing post, CW. A colossal film, and deserving of your eloquent prose. Thanks, JTL. I have a great fondness for the movie and hope that came through. Whenever I watch one of Flynn's adventurous romps I always walk away feeling like I have just seen my favorite. Right now I'm thinking "The Sea Hawk" is clearly the winner for me. There is so much fun being had throughout this one that it makes me want to jump up and partake in some swashbuckling entertainment of my own. Unfortunately, I'm not the man that Flynn is, and I have decided just to sit back and enjoy him in all of his splendor. I for one am ready to drop everything I'm doing right now, and head home for some Errol Flynn fun. Thanks as always for your enthusiastic and passion filled writing. I was often a cardboard sword wielding pirate for Hallowe'en as my puffy sleeved blouse could alternate between pirate and gypsy. There's something so liberating even in imagining the wind in the sails and the derring-do. "This is what movies are all about." Great choice for a review Caftan Woman. 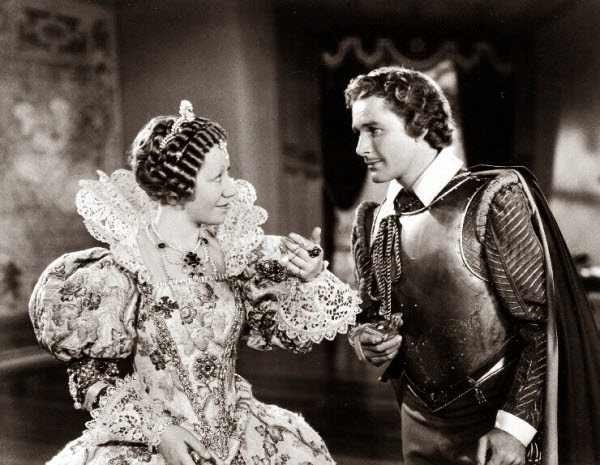 There's nothing like and Errol Flynn swashbuckler and Sea Hawk is one of the best.This is what these films should be all about, forget Pirates of the Caribbean. When my daughter was young she made me watch the first "Pirates of the Caribbean" with her. Oh, how I suffered for motherhood! I don't know why that series doesn't work and I don't want to spend the time trying to find out why. On the other hand, the kid has always had a good time when I make her watch Flynn. Ha ha! I love your idea of "vicarious adventure". I'm with you! Sea Hawk is one I've not seen, but it sounds fabulous. Errol Flynn always gave an audience their money's worth, didn't he? It's a grand movie to get lost in. Even the memory of it brings a smile. Just saw the link on Laura's site. I'll definitively rewatch it now with hopefully new insights. I just found Brenda Marshall so boring, I was missing Olivia the entire time. I'll admit Ms. Marshall was an adjustment for me, but I have grown fond of her in recent years.